You can battle zombies, undead, robots or a frozen yeti. When you gear up and slip on the VR headset, you’re immediately transported to a new world; a new reality. Depending on the game selected, either work together or compete head-to-head for the high score. The intense graphics on the state-of-art 90fps headset make every motion feel real with no lagging, no buffering, and no motion sickness. We offer the following exclusive games, only available to St. Louis at Amp Up Action Park. Zombyte is a genre-defining zombie survival game. Join the Z.W.A.T (Zombie Weapons and Tactics) to fight off an army of zombie-like creatures; humans with brain enhancements that have been infected by a computer virus. But these zombies aren’t alone; they are joined by a force of infected robots. Each enemy attacks in a different way, so you must communicate with your team and maneuver to avoid being hit. Do you dare to take on the invasion with your friends? Experience a snow ball fight like never before. Maneuver your hovercraft on a frozen lake to collect golden coins, but watch out for your opponents and the crazy yeti as they both shoot icy snowballs at you. Seek out the power-ups to give your snowball shooting, super powers. This family friendly game will entice you with it’s cute and unique look and is a guaranteed virtual reality party smash. Oh, one last thing… beware of the yellow snowballs. 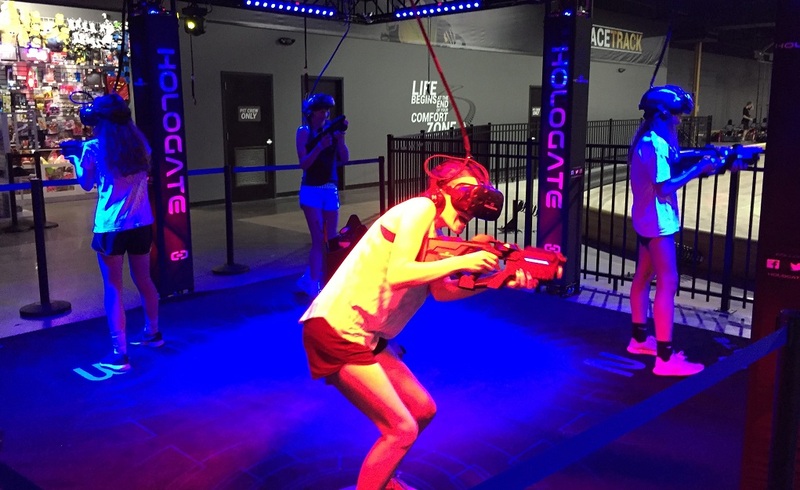 Rent the virtual reality arena for a private event by the hour during non-peak times. Call our events coordinator for pricing at 314-439-8008. Requirements: Must be a minimum of 42” tall to participate. Parental guidance suggested. Some VR games are suitable for all ages, some are not.